The following guest reviews are submitted by guests after their stay at the Tri Valley Inn & Suites. These reviews are the opinions of the guest that reflect their experience at this property. "A keeper!!! Found my forever place to stay in Bay Area. Cozy & Quiet!" "The property was cozy and quaint. Felt like a little apartment (I had a Queen suite). People were so very nice and helpful always with a smile!! ...."
"Room was clean and nicely decorated. Close to shopping and restaurants. Staff was friendly and helpful with directions. And all this at a very reasonable rate....."
"Clean Rooms with affordable price made us stay at Tri Valley Suites. Hotel location was great and everything we required was available. Staff assistance was really appreciated. 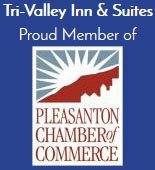 We would visit...."
"Tri Valley Inn, Pleasanton is well located and close by to everything. Rooms were clean and stored with all required amenities. As it was quite around we had good sleep....."